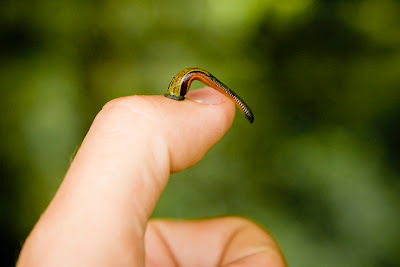 This tiger leech is a parasite after my own heart. I appreciate its audacity, daring, and appetite. It was picked up by Michiel (yes, that's his thumb) while on a jungle trek on Borneo. Of all the wildlife to be seen, the ladies on the trip were the most adept at spotting leeches, since they had all been told lovely taking-a-shower-and-finding-these-blood-sucking-friends-in-your-pants stories. Um, yeah. Those stories would have gotten my attention as well. One time I was swimming in the creek on my parent's farm and a strange little "eel" swam up to me. Which I proceeded to play with until it "got stuck" on my toe. My father got it off by spraying it with WD40. Who knew it had so many uses? Needless to say, I have loved WD40 ever since. omg! Borneo, just talking to my friend on the phone, we had to do a little play/poem, that was about Borneo in 6th.